Bouillabaisse, Provençal fish soup. Photo courtesy MackenzieLtd.com. From Aspic To Broth, From Avgolemono To Borscht, Learn Your Soups! This is Page 2 of a six-page soup glossary. This page includes aspic, bisque, bouillabaisse, bouillon, broth and other soup types with A and B. There are thousands of different soups in the world’s cuisines; this glossary focuses on soups found in the U.S. Click on the black links below to visit other pages. See our many other delicious food glossaries. This glossary is protected by copyright and cannot be repurposed in whole or in part. 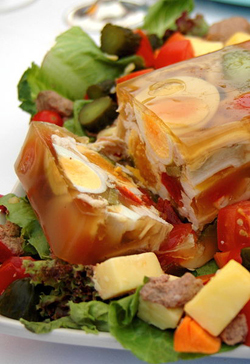 An aspic is jellied broth made from meat or fish stock. It is refrigerated, where it becomes solid, like gelatin; then is cubed and used as a relish for meat, fish or vegetable dishes. Or, it is used as a filler mold that holds meat, fish or vegetables. See photo at right. 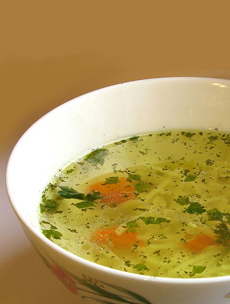 A Greek chicken broth made with egg and lemon juice. Barley, a nourishing grain, has a nutty flavor and a chewy texture like al dente pasta. It’s a very good source of fiber (also copper, manganese, phosphorus, selenium, and a good source of copper and). Barley makes a hearty soup, whether on a chicken, beef or vegetarian base. Beef and barley soup and mushroom barley soup are two popular combinations. Aspic isn’t soup, but it’s made from soup—specifically, stock. Here, chicken aspic cloaks chicken, eggs and vegetables. Photo by Anthony Georgeff | Wikimedia. Bean soup can be made with almost any type of bean, generally in a beef or vegetable broth or as a purée. A ham bone is a popular addition. The soup can be single-bean or a blend; 16-bean-soup is the largest combination we’ve seen. Originally, multibean soups used beans left over from prior days’ meals. Bean soup is on the menu in of the restaurant in the U.S. Senate every day. Two different recipes are used; both use navy beans and ham. 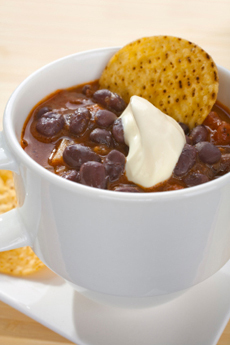 Here are the bean soup recipes if you’d like to give them a try. Eleven-Bean Soup. Photo courtesy Frontier Soups. Beef soup can span a broad variety of styles, as long as they include some form of beef. They can be bean soups or other vegetable soup with stewed beef, bouillon or consommé with sliced beef or even “hamburger soup” with ground beef. Black beans are indigenous to Peru* and spread throughout South and Central America by traders and migrating Indian tribes. They were introduced into Europe in the 15th century by Spanish explorers returning from their voyages to the New World and were subsequently spread to Africa and Asia by Spanish and Portuguese traders. Beans are good protein and a very inexpensive form of it, so became an important staple in many parts of the world. All were made into soup; but perhaps the best-known from Latin American cuisines is black bean soup. It is a hearty soup of beans and broth and tomatoes (also indigenous to Peru). 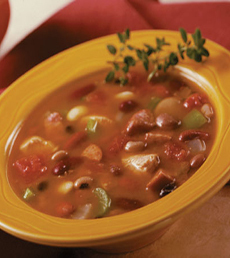 It can be made quickly with canned black beans, canned diced tomatoes, chicken broth, onions, carrots and spices. Optionally, sausage, ham or other meat can be added. Cotija cheese is usually crumbled on top, but feta can be substituted. Black bean soup. Photo by Traveling Light | IST. Black bean soup achieved popularity in the 1970s with a recipe from the Coach House, a legendary former New York City restaurant (now the location of Mario Batali’s restaurant Babbo). More French in inspiration, the Coach House recipe black bean soup recipe use bacon and ham hocks, Madeira and chopped hard-cooked eggs. *Along with kidney beans, pinto beans and navy beans which are all known botanically as Phaselous vulgaris, the common bean. These four beans are varieties of this species and genus. A Chinese delicacy, when dissolved in water, the birds’ nests yield a gelatinous substance used for savory and sweet dessert soups. The substance is supposedly rich in nutrients believed to provide numerous health benefits, from aiding digestion and alleviating asthma to improving the libido and the immune system. Bird’s nest soup is one of the costliest dishes—up to $100 a bowl—due to the challenge of obtaining the nests. Hong Kong and the U.S. are the two largest importers of the nests of the White-nest Swiftlet (Aerodramus fuciphagus) and the Black-nest Swiftlet (Aerodramus maximus), the two varieties whose nests are used in the soup. Bird’s nest soup. Photo by GeeJo | Wikimedia. A bisque is a thick, rich soup made from fruits, vegetables, game fish or shellfish (particularly crab, lobster and shrimp) and thickened with cream. 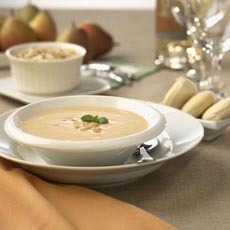 Popular bisques include chestnut bisque, crab bisque, lobster bisque, squash bisque and tomato bisque. A key difference between a chowder and a bisque is that a bisque is a more elegant recipe, puréed until smooth, and often contains sherry. Chowders also contain pork fat back. Here’s a recipe for crab or lobster bisque. Scallop and lobster bisque. Photo courtesy Hancock Lobster. Borscht dates back at least to Medieval times. It was a food of the poor; beets were plentiful and inexpensive. There are two types of borscht: hot and cold. Both are based on beets, but are otherwise prepared and served differently—one for winter and one for summer. Hot borscht, which originated in the Ukraine, is a hearty beet soup that can also include carrots, potatoes, spinach and beef or other meat, seasoned with dill. It is usually eaten as a first course with pumpernickel or other dark bread, and can be garnished with sour cream. Hot borscht with beef and sour cream. Photo by Tanya F. | Wikimedia. Almost all Eastern and Central European countries have a version of borscht. Most contain beets, but some have tomatoes or other vegetables as the primary note; some are vegetable soups with no beets. 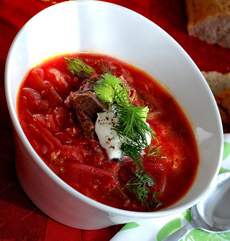 Cold borscht is warm weather fare, a meatless soup served in one of two ways. It can be a clear beet broth cooked with onions, lemon and dill, garnished with sour cream; or the sour cream can be mixed in to create a pink, creamy soup. Either way, it can be served with a cold boiled potato. Bouillabaisse is a traditional Provençal soup or stew (the difference) that originated in Marseille; it is the city’s signature dish (see another photo at top of page). It contains a variety of fish, shellfish and vegetables (celery, leeks, onions, potatoes and tomatoes). It is different from other fish soups due to the Provençal herbs and spices in the broth: basil, bay leaf, fennel, garlic, orange peel and saffron. 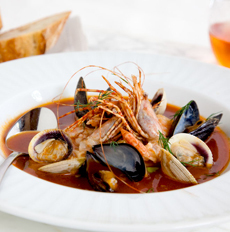 Bouillabaisse also requires the use of bony local Mediterranean fish. * Finally, it has a distinctive method of serving: Traditionally the broth is served first, in a bowl that contains garlic bread and rouille†, a mayonnaise made of olive oil, garlic, saffron and cayenne pepper. Bouillabaisse. Photo courtesy Domaine Chandon. 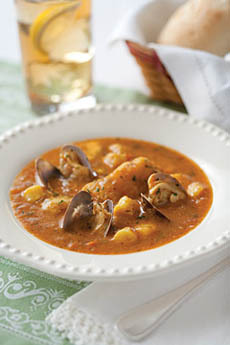 *There are at least three kinds of fish in a traditional bouillabaisse. These can include conger, monkfish (lotte), mullet, scorpionfish (rascasse), sea bream (dorade), sea robin (grondin), silver hake (merlan) and turbot. It also includes crab, langoustine, mussels, sea urchin and octopus. There are many recipe variations, but what is constant is that the mixture of fish and shellfish is cooked in a court bouillon (a seasoned poaching liquid) with tomatoes and saffron. †Rouille (roo-EE, the word for rust in French) is a sauce made from olive oil with breadcrumbs, garlic, saffron and cayenne pepper or red chiles, which give it the rusty orange color. It is served as a garnish with fish and fish soup, and is an essential with bouillabaisse. Bouillon is a clear, thin broth made typically by simmering chicken or beef in water with seasonings. It can be consumed in this state, or used as a base for other dishes, sauces, etc. Bouillon can be made from mixed sources, e.g. chicken and vegetables. Bouillon (not to be confused with bouillon cubes) is a stock that is strained, and then served as a clear soup. It can be enhanced with other flavors; for example, sherry, herbs and spices. See also broth, below. Broths is made from a clear stock. The terms bouillon and broth are used interchangeably: a thin soup are made from a clear stock foundation. One way to distinguish them is that a bouillon is always served plain (with an optional garnish), whereas broth can be made more substantive with the addition of a grain (corn, barley, rice) and vegetables. 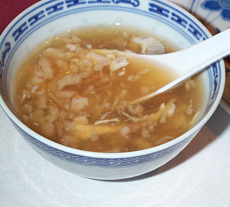 Plain broth is a thin soup, but it can be thickened with starch or the addition of rice, barley, vegetables or eggs. Examples with eggs include Chinese chicken egg drop soup, Greek avgolemono soup and Italian stracciatella soup. Consommé is a refined broth. Velouté is broth thickened with eggs, butter and cream. Jewish-style chicken soup is a chicken broth.